Nineteen Sixty-four: ...and the Catholic election winner is... Neither? ...and the Catholic election winner is... Neither? It is the day after the election and many are busy declaring victory or pointing fingers in defeat. Yet at the midterms there is always one big group that no one wins: non-voters. The size of this group always makes it difficult to say any party "won" a sub-group of the electorate because so many choose to stay home when the presidency is not on the ballot. We can clearly speak to who won among the voters, but the non-voters always outnumber this crowd. Thus, any attempt to identify a trend from 2010 to 2008 is tenuous at best as we really are speaking about different electorates (and the 2010 voters will be joined in 2012 by many who did not vote yesterday). Catholics, like other potential voters, were more likely to sit out the 2010 elections than cast a ballot. Among those who did vote, exit polls show a clear preference for Republican members of the House over Democrats (54% to 44%). Protestants were even more likely than Catholics to select a Republican over a Democrat (60% compared to 39%). Once one accounts for non-voters, about 23% of adult Catholics voted for a Republican to represent their district in the House of Representatives, 19% selected a Democrat, fewer than 1% voted for a member of a third party (or skipped this office on their ballot), and 57% chose not to vote (or were not eligible/able to do so). The number of Catholics showing up at the polls and voting for a Republican candidate (i.e., highest office) dropped 24% from 2008 to 2010 (from 16 million to 12.2 million). The number of Catholics showing up at the polls to support a Democrat dropped significantly more—down 48% (from 19.2 million to 9.9 million). Thus, the Catholic vote did "swing" toward the Republicans but it did not get bigger. We are not comparing the same size pies between elections and the Catholic Republican slice got smaller and the Catholic Democrat slice much smaller. Comparing 2008 to 2010 is like comparing an entree to an appetizer. The problem... so many Catholics (and non-Catholics) chose to skip the dinner (as usual at the midterm). It is the case that Catholics are looking more like a swing vote that correlates well with the overall results. In 2004, a plurality voted for Bush. In 2006, a majority stayed home. In 2008, a plurality voted for Obama. In 2010, a majority again sat out the contest. 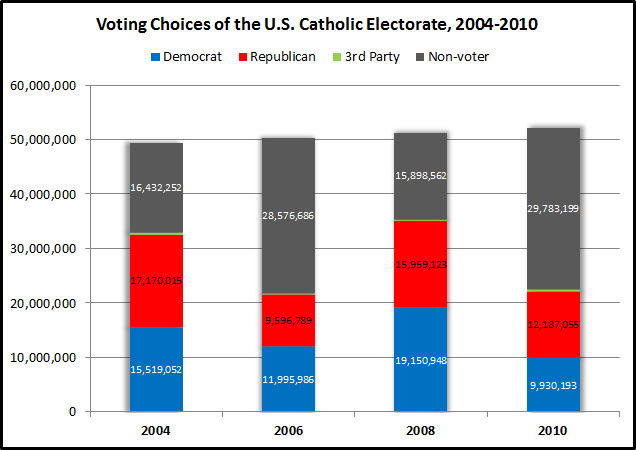 Expect a Catholic plurality to vote with the winner again in 2012. The figure above is generated using current estimates of the voting eligible population and voter turnout from Michael McDonald at George Mason University, U.S. Census data for total adult population size, CARA Catholic Polls (CCP) for Catholic population size estimates, and election exit polls for the size and distribution of the Catholic vote. Exit polls indicate Catholics made up 25% of all 2010 voters. The total size of the adult Catholic population in the United States is approximately 52.4 million.